Hampton Inn Baltimore Downtown Convention Center pays attention to the minor details. This facility provides 126 guest rooms and suites, including accessible rooms, state of the art audio/visual capabilities and complimentary Wi-Fi. 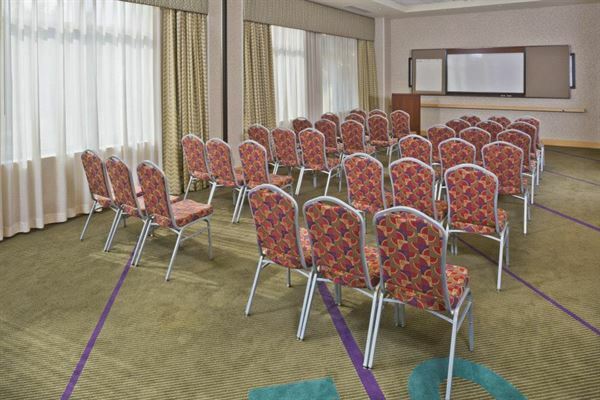 Our function rooms hold up to 60 people for Camden Yards seminars and post-game celebrations. We can join our Orioles Room and Raven Room for you which accommodates groups up to 60 people. The Orioles or Raven Room is ideal for Groups up to 30. They are bright and airy with natural light. Wherever your travels take you, you can count on us to deliver value, consistency and service with a smile. 798 square foot meeting room space leading out to our beautiful patio. Our Ravens/Orioles rooms can be combined for one larger meeting space or divided equally to separate your group. Room comes standard with complimentary wireless high-speed internet access. The rooms also allows in lots of natural light. Do something different for your next event with Spirit of Baltimore! An Inner Harbor cruise becomes the perfect venue for corporate or social gatherings, weddings, birthdays, anniversaries, or simply entertaining guests. Offering dining, entertainment and sightseeing all in one place, Spirit turns your celebrations into unforgettable memories. Fun, fresh and totally decked out, Spirit of Baltimore offers a dynamic experience on the water, complete with buffet dining, live DJ entertainment and picture-perfect views from our rooftop deck. All Saints Banquet Center is one of the premier banquet halls in Maryland. Make a choice based on budget and need from our two large banquet halls. Our banquet halls can be used for weddings, business, birthdays, quinceaneras, bar/bat mitzvahs, and so much more. Our expertise in event planning and rentals gives us an edge above our competitors. Our experienced staff are readily available to ensure your event success. We are sophistication with modest cost! We recently completed updates to include a brand-new perimeter fence outside the venue, and glass doors throughout. Contact us to schedule a tour of our flexible event space! The cost for event rentals covers service fees for set-up and break-down.